Already in the first six weeks of this year Petitions requesting the winding up of 28 Irish companies have been presented to the Courts. Over half of these have come from the Office of the Collector General. Our latest figures show that the office of the Collector General has requested that 15 Irish companies be wound-up this year in an attempt to recover outstanding taxes. A creditor can petition the Court to have a company wound up if they can prove that they are owed over €1,269.74. According to their latest set of financial accounts, the 28 companies facing winding up petitions owe their short creditors almost €30m in unpaid debts. The 15 companies that the Collector General's office are pursuing, owe €18.2m and further research into their accounts shows a sum of €1.3m being owed in taxes*. These figures are in line with what we saw in the first six weeks of 2011.
of accounts display a full breakdown of creditor figures. This pursuit of outstanding amounts is not restricted to commercial entities. 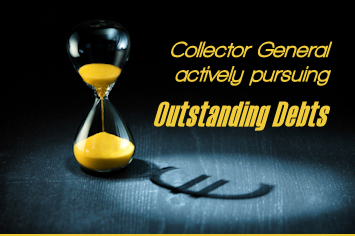 Our data shows that the Office of the Collector General has been awarded 90 Judgments against consumers in 2012. These were worth €3.8m and make up 28% of the total number of consumer judgments awarded this year.